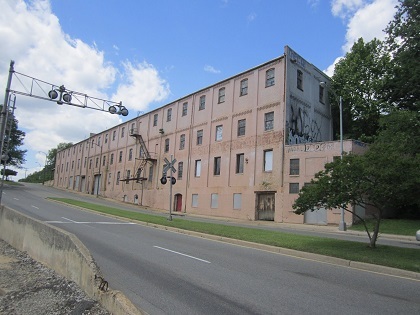 The Armitage Building is a two-story warehouse building located between Rockett's Landing and Shockoe Bottom in the City of Richmond, Virginia. The two-story Armitage Building is a warehouse complex that stands on the north side of Williamsburg Avenue on an approx. 4.56 acre parcel in the City of Richmond with Libby Hill Park to the west and Stone Brewing to the east. The property was originally the headquarters of the Armitage Manufacturing Company, which produced tar paper roofing materials. The main portion of the building was built in 1900. It was designed by the Richmond firm Noland & Baskervill, now known as Baskervill, when the firm was just three years old. The industrial building consists primarily of two wings, with the original two-story brick-constructed plant built in 1900 for the production of building supplies and roofing paper, and then used for corrugated container manufacturing. In 1954, a large barrel-roofed, metal bowstring truss wing was added to the rear corner of the warehouse.